Farmstead at Long Meadow Ranch takes farm-to-table dining to heart. 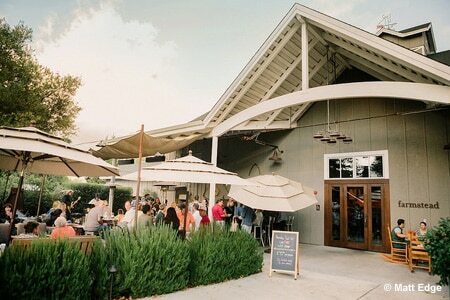 : In a day when “farm-to-table” dining has become practically de rigueur, Farmstead ups the ante. Nearby Long Meadow Ranch supplies the restaurant with grass-fed beef, vegetables, honey, wine and olive oil, and the rustic-chic setting---a towering, beautifully renovated nursery barn from the 1870s---features many original materials in new roles: tree stumps as side tables, antique farm equipment as groovy chandeliers, the stone foundation repurposed as the outdoor lounge’s fireplace and booths upholstered with cattle hides. Expect rich comfort dishes and a meat-friendly menu, such as juicy burgers on shiny, egg-brushed potato buns with local cheddar, arugula and crisp-roasted rosemary potatoes, or the allspice-scented meatball trio that sizzles in a cast iron pan with tomato marmalade and caramelized mirepoix. Try soft gnocchi with chunky, charred, ultra-tender ragoût of beef; flank steak that’s a tribute to the grill with creamy potato purée with kale and Cabernet butter; chicory with farm egg; or buttermilk dumplings and chicken. Almost worth a visit on their own are the warm cheddar drop biscuits in a cast iron skillet, crunchy and served with apple jam. The wine list features an enormous choice of hardly-marked-up bottlings from Napa Valley and beyond. In warm weather, enjoy the tented patio facing venerable trees and a demonstration garden where your dinner ingredients may have originated.